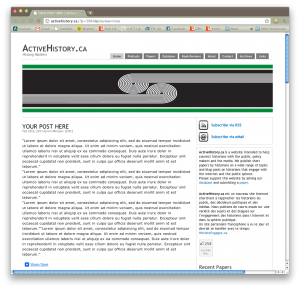 Home » ActiveHistory.ca • Announcements • Does History Matter? The ActiveHistory.ca team is looking for more contributors for our collaborative blog on how history and historians actively engage communities and contribute to current debates. This blog has a growing readership – last month we had nearly 4,000 distinct visitors – and it provides potential contributors the opportunity to reach a wider audience. If you’re interested in contributing, please read more to find out what we’re looking for! Participants will be listed as “Contributing Editors” and are welcome to take a role in shaping the future direction and mandate of our web project. Our contributors range from engaged community members to faculty members to graduate students, and the more diverse the better! Participation may vary from a monthly post to a few posts a year. We would like to find historians from a wide range of backgrounds and expertise in all periods and geographic regions of history. We also hope to encourage participation from historians outside of academia, whether this is people with historical training who now work in another field or laypeople with a passion for history. Please feel free to forward and distribute widely. If you are interested please contact us at info@activehistory.ca. We look forward to hearing from you!